Also may have missed Ryan Miller's terms earlier today: 2 year deal, $2M AAV with ANA. 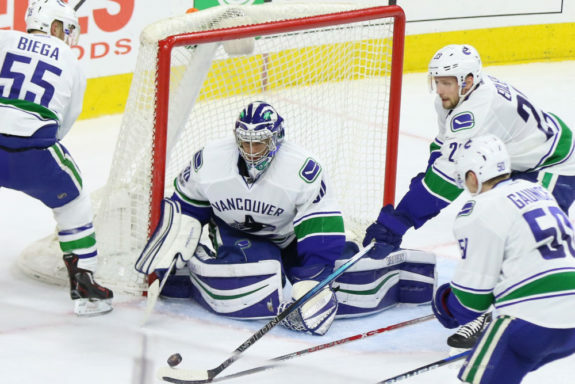 For the last three seasons, Miller has donned the Canucks jersey – playing in 150 games and earning a 64-68-16 record with a .914 save percentage and 2.69 goals against average. Last season, however, was a tumultuous one for Miller and the Canucks. The 36-year-old played in 54 games for Vancouver with a disappointing record of 18-29-6. He finished the year with a .914 save percentage and 2.80 goals against average behind a team that just couldn’t get anything going throughout the year. Originally drafted in the fifth round, 138th overall, by the Buffalo Sabres in 1999, Miller spent parts of 11 seasons in Buffalo before moving on to St. Louis and eventually Vancouver. He racked up a 358-262-74 record in 709 regular season games so far over his career to go along with a .915 save percentage, a 2.61 goals against average and 39 shutouts. On top of that, he has a 28-27 record in the postseason with those three franchises with a .915 save percentage and 2.49 goals against. Miller’s best season – statistically speaking – came back in 2009-10 with Buffalo when he had a 41-18-8 record in 69 regular season games to go along with a .929 save percentage and 2.22 goals against average. He also added five shutouts to that stat line. While some might question the Ducks motives going after a 36-year-old with John Gibson in net, it could play out a number of ways for the Southern California franchise. For starters, Gibson has had a history of injuries including last season. The addition of Miller could both motivate Gibson to play to his overall potential and give the Ducks a viable option if their young starter doesn’t live up to expectations. On top of that, it seems like a great fit for Miller who is likely looking to add a Stanley Cup to his resume. While the Ducks obviously aren’t a guaranteed Cup candidate, they could be on the right track by adding a solid option at the backup position.